Just here to give a shout out to what I 'feel' is THE next tvN mystery thriller we can sink our teeth into - but with a bit more spine-tingling romance thrown in there for good measure. The first episode was riveting for so many reasons, at least for me. Stellar stellar cast - Lee Chang-Joon! (Yoo Jae-Myeong) in the first scene! You got me! The corrupt top cop (Choi Byung-Mo) back and up to no particular good! I feel the right vibes about this one, the dialog is excellent, and so much unexpected little things already. The top 4 leads already indelibly on my mind. Thanks for the head up @meechuttso! You brought me back to this thread that i left for too long. I heard about this new drama but decided to ignore it a long time ago despite its interesting cast. I watched the original j-drama and hated it, especially the end and won't go through that kind of negative feelings a second time. However, like @bedifferent said, the best way to live again the positive feelings from SF is to follow the team on Life: it's not as good or riveting as SF but it's still a good drama, with an excellent cast and very solid PDs. I have 2 episodes left to watch: but so far i can say safely that there"s a lot of parallels that can be draw with SF and i'll come back when i'll finished it to share my opinion. @titania1000 I watched Life and enjoyed it. Not as good nor is it perfect. Despite all the negative knets reactions and some flaws, it is an uplifting drama about the imperfect state of our medical care system and the people that cared enough to fight for us against corruptions, even their own vices. It is an uplifting drama about ordinary people doing extraordinary things for others. Lots of heart. It’s different enough from SF . The drama and JSW are up for awards at the end of year. Don't know how accurate is this page but check this out. The APAN awards gave us a kind of mini SF reunion: it's a tiny pic but it warmed my heart despite all, since i still have a lot of love for the actors and for their characters on SF! Well done ladies and gentleman! A hug well deserved! I miss this cast and would give anything to see them work together again! They had only few scenes together but Boy did they stole the screen! The following is one of the best scene of the drama! Definitively on my top 5! I totally agree and shared my view in Life thread. I really hope to share a new drama with you: it would be nice to have insightful discussions again! Sort of saw it coming but still annoyed they killed of the Eun-soo character. Have been reading through discussion after each episode and she seemed to get so much hate from some watchers just because she might have been a potential road block to the main two getting together in a show that doesn't need romance at all, especially between the main two where I don't see any romantic chemistry. Her life was ruined when her dad got framed with her marriage getting called off, dad disgraced, then getting ill etc. She was a bit rash at times but she was fully entitled to try and get justice for her dad and seeing her put so much into it to the extent that she never really led a proper life after that, only for it to end without her getting the justice she was working for is disheartening. The first time you see her have any fun is the previous episode when they're all having dinner. And the main guy - fair enough I get that he has no feelings but he was harsher to her than any of the other females around him - constantly belittling her and being rude, humiliated her in front of his team, even something as small as dropping her off home he just leaves her at a train station, especially their last interaction when all she was trying to do was help him figure out who broke into his place but he's just telling her to go away and not let her know what happened. What's sad is that she's so used to it. It's a shame they gave the character a really one-sided attraction to the main guy because the way he has treated her just makes me dislike him, especially as he's not that much of a richard simmons to everyone else otherwise I wouldn't care. He used her and put her in danger everytime he needed it and then would just kick her to the curb when he had no use for her - which is exactly why I don't buy some reasoning I've read about him "protecting" her by keeping her out the investigation. He's seen the extent she will go for her family yet thinks ignoring her will make her stop? Same with her dad. Can see the show using this as a catalyst for the main lead to get better and hint/lead to some romance between the main two in typical kdrama fashion as he opens up but I hate that - just makes the death seem so cheap as her her death isn't about her, but more about the leads. In every scene in the last few episodes he's been trying to get rid of her asap and is happy to spend time with the main female lead and has shown no interest in Eun-soo fair enough - so now looking at the preview for the next ep he seems very affected by the death but I just don't buy that with the way he has been with her all series. Her death being a catalyst for his recovery would make no sense to me. I can't feel sorry for him feeling sorry for her. Can see him finding her notebook where I'm assuming she wrote about seeing the 07 tattoo on that team members back which will help him solve it - now that she's dead I wonder if he'll finally her some props. Because the way he constantly ignores her clearly makes her think she can't go to him without solid proof or he will never listen to her, which is probably how she ended up at the house she died in as she was left investigating alone. She had to fight to get any time with him despite him supposedly being her mentor. If it was a main lead with the backstory she had no-one would have issues with her going above and beyond to try and solve this case for her family. I don't know what will happen in season 2, if they finally announce it, but I hope we don't get a romance. It is comfortable just to watch these two as friends, like we have endless shows with romances, one show can be spared, no? Shi Mok was a dry character and yeah, you wanted to shake him everytime he was so rude to her, but I couldn't hate him. 31 December? That is so far away At least it seems to finally happen. Secret Forest 2 (동백꽃 필 무렵) which is also known as another title "Stranger 2", is the latest Korean drama that will be aired by tvN in 2019. The K-Drama series is the second season of the popular drama Secret Forest which aired on July 10, 2017 last year. The Korean drama Secret Forest 2 (동백꽃 필 무렵) continues the story of Hwang Shi Mook and his partner Han Yeo Jin to uncover corruption cases from the prime minister. Season one stars Jo Seung Woo, Bae Doo Na, Yoo Jae Myung, Lee Joon Hyuk and Shin Hye Sun. Some of the cast will return to star in this second season. 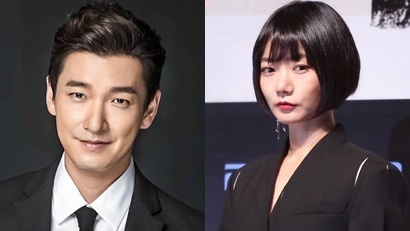 Secret Forest 2 (동백꽃 필 무렵) actor-acresses who have confirmed playing this drama are Jo Seung Woo and Bae Doo Na who will play their main roles. In 2018 Bae Doo Na also appeared in the latest drama series Matrimonial Chaos which aired on KBS2 on October 8, 2018. While actor Jo Seung-wo appeared in drama Life (2018). Lee Joon Hyuk, Choi Jae Woong and Yoon Se Ah will again be supporting players in this latest TVN drama. Yoon Se Ah reportedly also appeared in the latest Korean drama series SKY Castle which aired November 23, 2018. All right, just read at the complete synopsis of Secret Forest 2. The sequel from Strangers who continued the story of an emotionless man as the main character of Hwang Shi Mook played by Jo Seung Woo and his best partner Han Yeo Jin played by Bae Doo Na to reveal the truth in the prime minister's corruption case. The opening theme song is so remarkable and the black & white background is perfect as well. I hope Season 2 opening have same impact as well. I checked Korean sources and there are no news at all for a 2nd season. The title quoted in the source "동백꽃 필 무렵" doesn't have anything to do with Secret Forest but is the Korean title for a upcoming KBS2 drama. I think we should wait and see and rely on Korean news outlets for a season 2 confirmation. Bae Doona is busy filming Kingdom season 2 right now and this will take up a couple of months for sure.